The lobby of our building once aspired to be grandiose: twenty-foot ceilings, terrazzo floors, a glassed-in reception area, and the entry way to a rather good, up-market restaurant. Several financial crashes later, the bare bones of that lobby still exist, but where there were once fresh flowers on reception tables, there are now cheap wood carvings, and where there was once air-conditioning, the guard now waves his bamboo fan and slaps mosquitoes. All of this grandeur and decay is lost on the children, but they liked to stop and visit Pomelo Head. 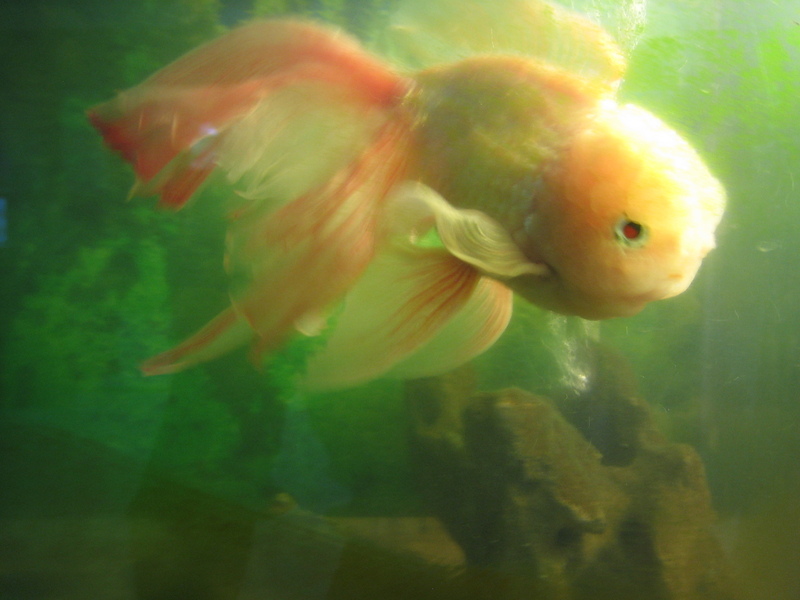 Named during our first week here, Pomelo Head was a large goldfish who inhabited a tank that had been inserted into an old Sylvania television set. (Pomelo is a large grape-fruit like citrus fruit for which Ascher is mad; I named the fish Pomelo Head because his head looked like it was made out of the large, translucent juice sacs of that fruit.) Pomelo Head seemed rather lonely and slow in his television aquarium, and Camilla liked to turn up his volume and adjust the resolution to see if anything would happen. One day, several small garra rufa fish were put in there with him, but, just as they eat dead skin off of humans, they chewed on Pomelo Head, too, and soon were taken out and put back into the fish pond in the front of the building. Pomelo Head seemed to enjoy the company, and began his slow decline after their departure. Regularly, we would come downstairs to find him floating upside down, gaping at us through the glass, and flicking his beautiful fins helplessly. A few hours later, he would seem to perk up again, and continue on until his next bout of belly-up. The Thais do not believe in euthanasia; like abortion, it’s a sin and is illegal. This policy unfortunately applies to animals as well (don’t even get me started on how nobody seems to spay and neuter the poor beasts, and all the miserable street animals that result from all this compassionate idleness). Poor Pomelo Head had no hope of being put out of his suffering and escaping his Sylvania cage, and was kept on the air long after I would have canceled his series. This morning, however, he was belly-up and caught in the uptake of his filter. The building’s manager came out and told me that that the fish was “may sabai,” a generic term for not well. I laughed and told her in English that I thought the fish was dead. She shrugged, smiled, and said that he was more than three years old, which I assume to be a good long life for a small goldfish. 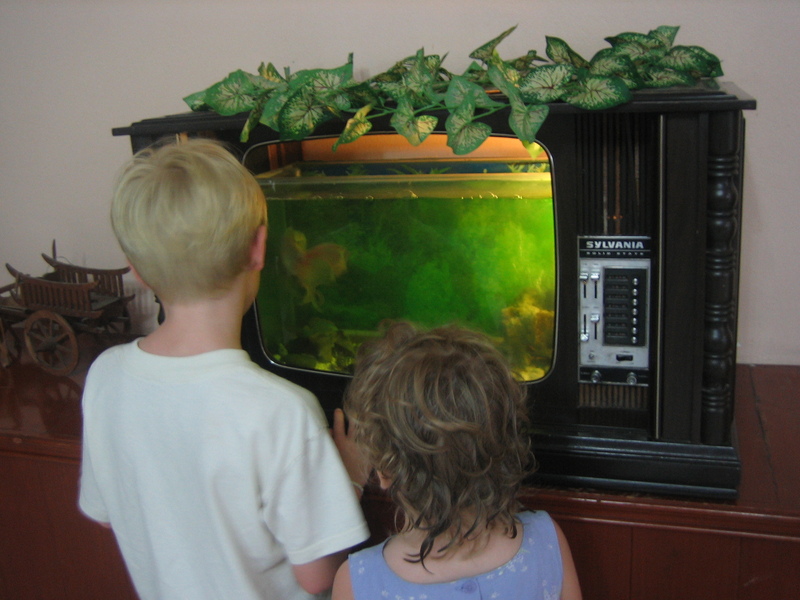 By the afternoon, the aquarium was empty, and by the time I came home with dinner, the shutters of the television cabinet had been decorously closed. Both children wept bitterly; that poor bit of goldfish was the closest thing to a pet we’ve ever let them have. 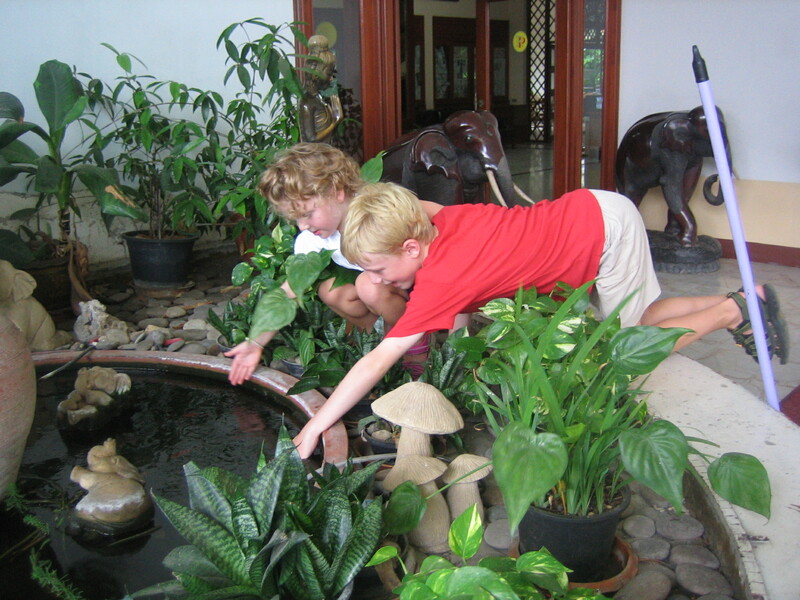 Fortunately, there are still the garra rufa in the fish pond, it’s fun to let them nibble on your hands, and when they die, no one notices. The fish tank in the TV is surreal! I love it.